How Long Can We Live Like This? One of the key reasons we wanted to retire early was so that could do a bunch of fun things while we’re still able to do them. I can imagine paddleboarding in the Caribbean when I’m 70, but I don’t think I’d like to be trying it for the first time at that age. I can imagine doing a lot of things at age 70 (snorkeling, swimming, hiking, etc.) but there are no guarantees in life. So we were motivated to get to it as soon as we could. We received a great question in a blog comment section (thanks Henry! ): “My concern, as we get older, is maintaining our physical abilities (exercise) and medical facilities. Maybe one day you can expand on that in your blog?“. So here we are expanding on that – keep those comments coming kneedeepers! I read this as “what do you do to stay healthy and live a long life?”, which is an important subject to us. We talk about it all the time and actually act on it too. In terms of physical health, it starts with what goes down your throat. 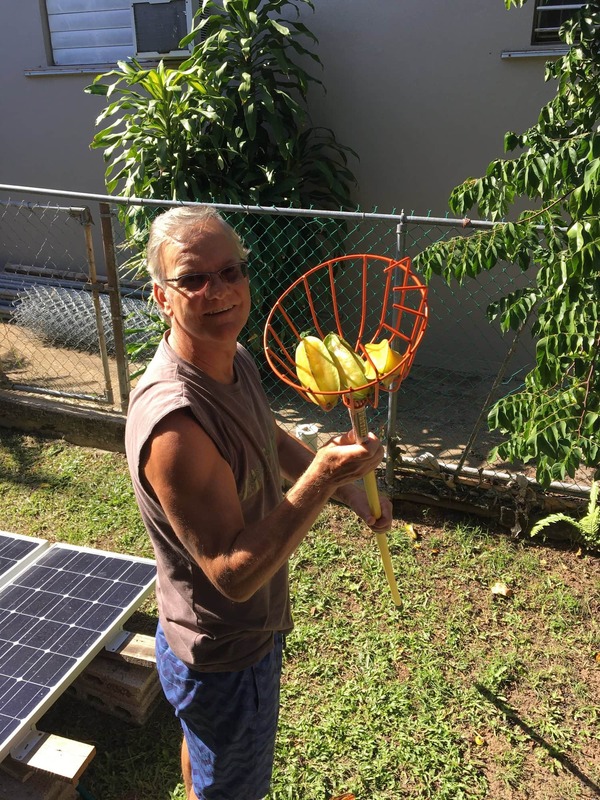 Although there is a moderate resurgence of vegetable farming in Puerto Rico, it’s unlikely to ever be the same as our home state of Florida, which is the 2nd largest vegetable growing state in the country (after CA). Fortunately for all of us, PR imports a significant amount of vegetables from the States and even a few other countries. There seems to be fewer processed factory foods here than in the States, and that helps our general health. I like to say we don’t buy food, we buy groceries and make food. 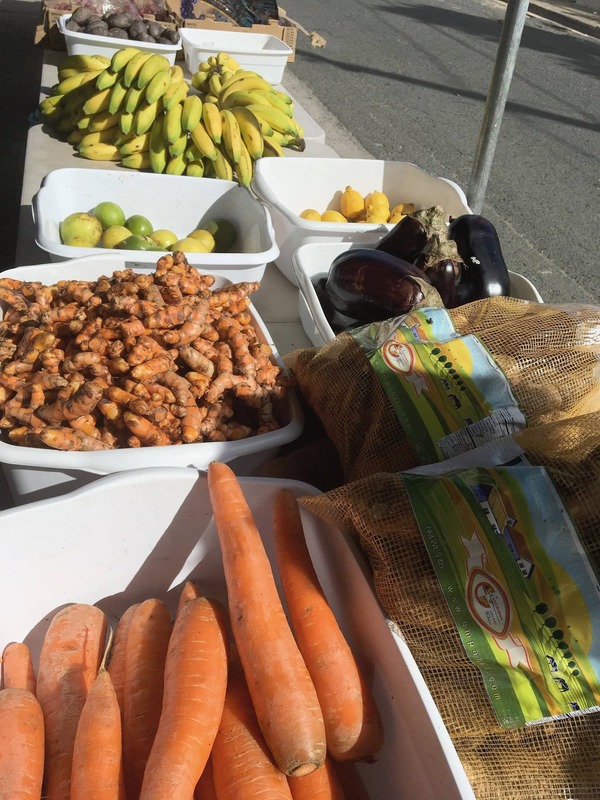 When we go to the Veggie Stand on Tuesdays & Fridays (when the truck comes over on the ferry from mainland PR) we might find pineapples, root vegetables, oranges, lemons, limes, tomatoes, lettuce, kale, sprouts, nuts, melons and gourds, stone fruits, potatoes, onions, lychee, tamarinds, and more. It’s first come, first served, and when they’re out, they’re out. Some of it is local, but most of it is packaged from the U.S. or other places. My only real gripe is that the garlic, anywhere on this island, is from China and is likely to be unhealthy. But regardless, this is a veggie stand, not a farmer’s market with all local produce, and it serves our need to eat fruit and veg. We can get all the other groceries we need from the colmados (neighborhood store) or the bigger grocery stores (there are two on the island). They have meat, cheeses, some fruit and veg, canned goods, booze, and other staples. We are careful to not over-indulge in the local Puerto Rican food (Comida Criolla – Creole Food) which is delicious, but it’s pretty calorie laden with lots of starches (plantains, breadfruit, yuca, potato, rice) and pork, much of it fried. 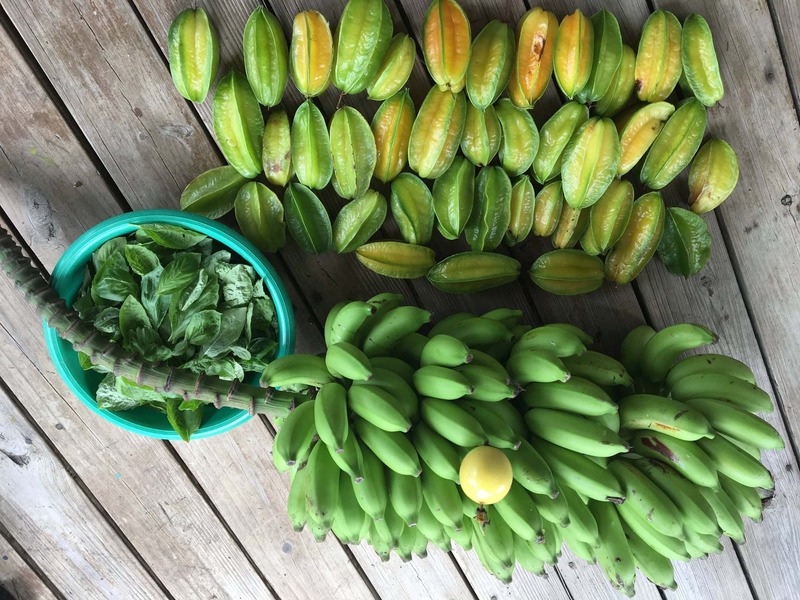 This local food has Spanish origins, with influences from Africa as well as ingredients from the Caribbean lands of the Taíno people. Mofongo for example, starts with fried plantains, mashed with spices & fried pork skins, and more oil. A serving can contain 750 calories, 55g of fat, & 60g of carbs, and that’s for a side dish! 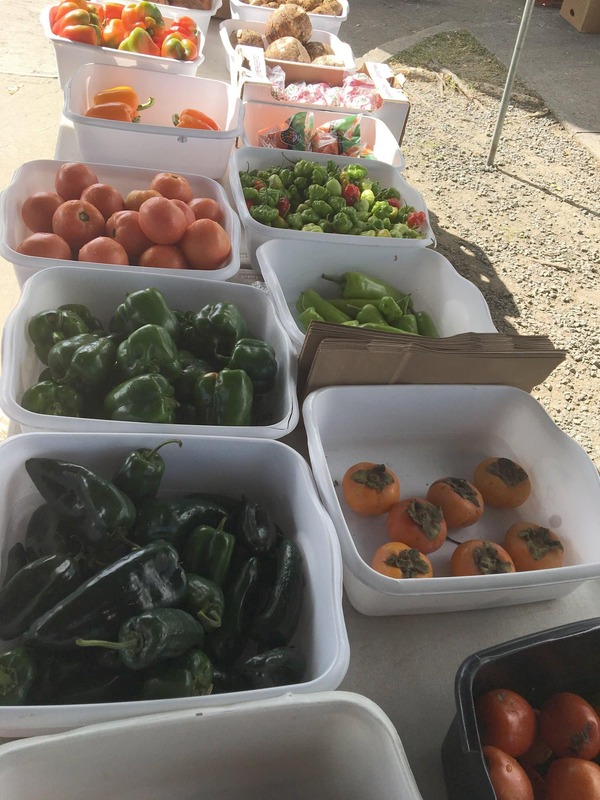 We’ve mentioned this before, we also harvest our own yard food. 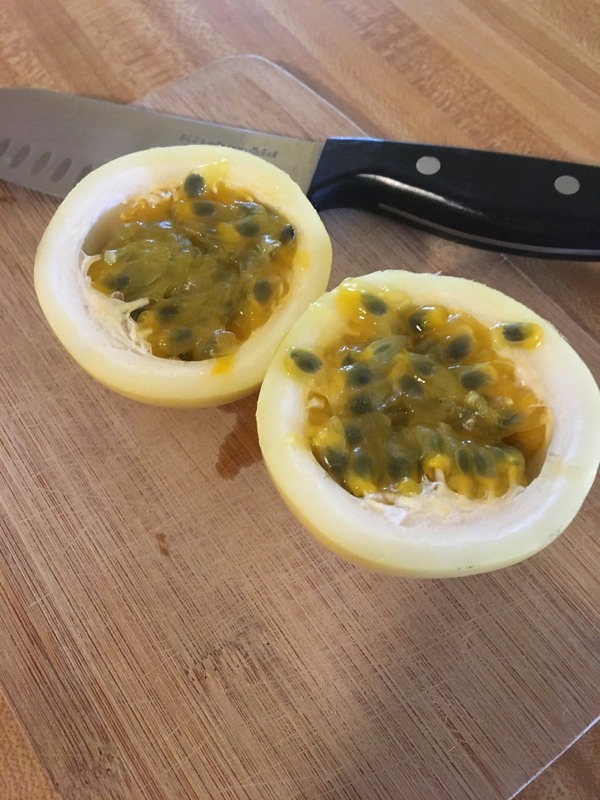 We get carambolas (starfruit), tomatoes, basil, culantro, bananas, and we’ve recently discovered passion fruit on the back fence! 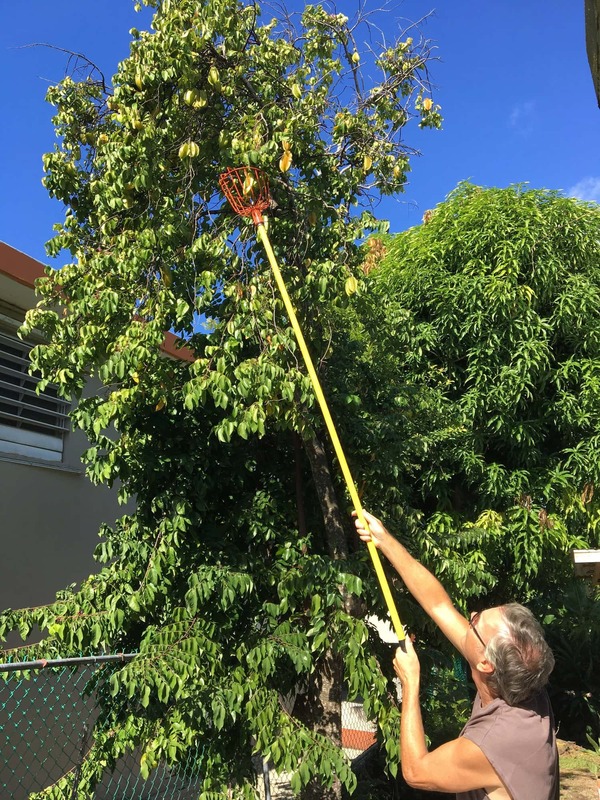 We have a breadfruit tree, but it’s at least 30′ in the air and the volleyball-size fruits are difficult to harvest. 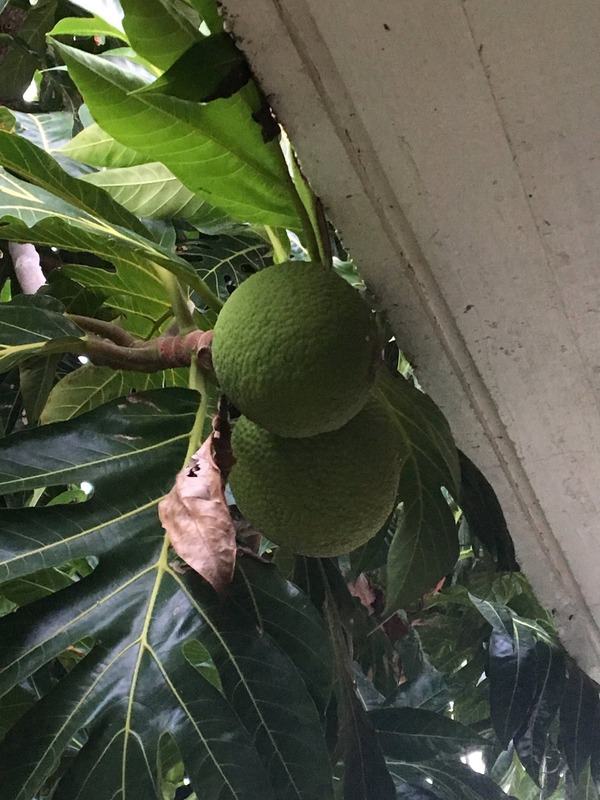 There is a huge mango tree and an avocado tree, but all my wistful looks and verbal encouragement haven’t pushed them to produce anything since the hurricane. And I suppose if I was quicker on my feet, we could eat fresh chicken every day, but those little cluckers are damn fast! Swimming – we like to put on a mask and snorkel, no fins, and swim up and down the beach for a fixed time. This allows us to focus on the body work instead of our breathing technique in the waves (i.e. not drowning). It doesn’t take long to get a good full body workout this way. 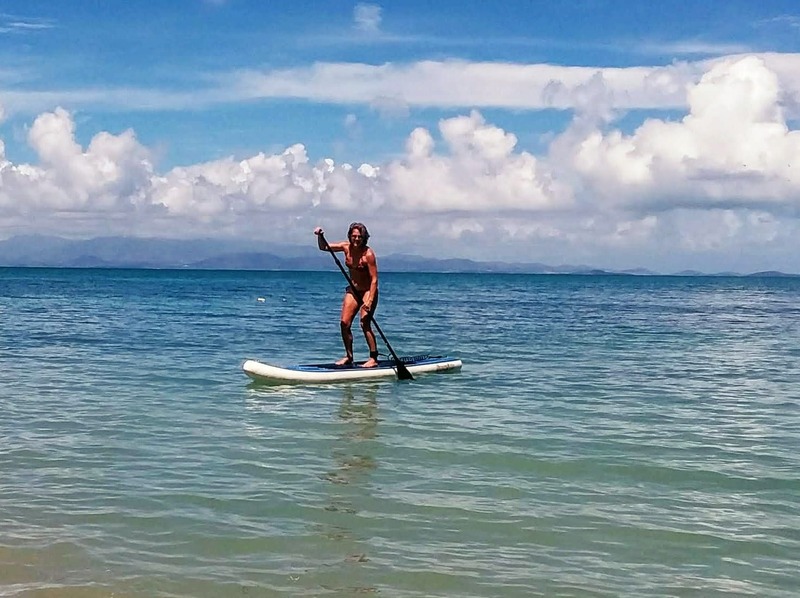 Paddleboarding – This is another full-body workout, because you stand in an athletic stance, slightly bent knees, while balancing and paddling. It works the upper body, core, and lower body all at once. 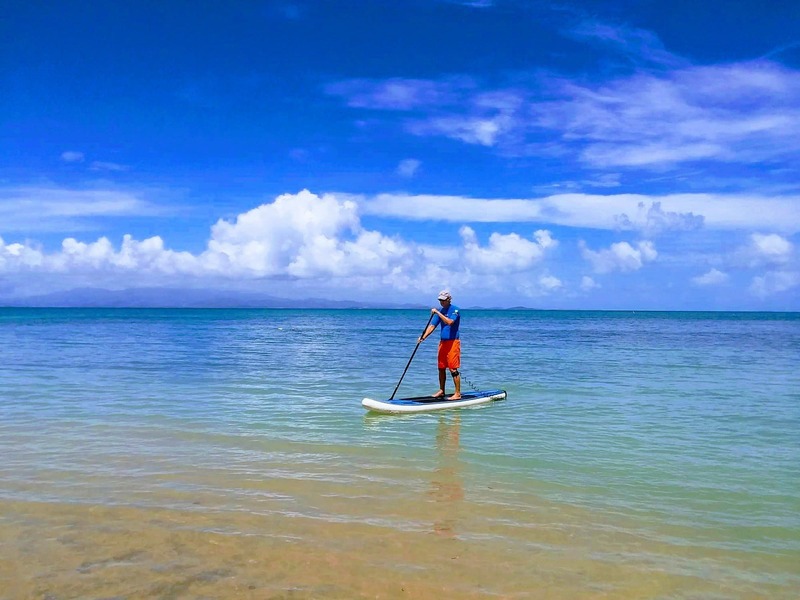 Kayaking – This is mostly upper body and core, and it’s definitely easier than paddleboarding, but we can go for a longer period of time, covering more distance. Snorkeling – This is easy when just floating on top, kicking with fins. But when you start to free drive, the legs and lungs get a lot more work. It’s easier with dive weights but you still have to propel yourself down, back up, and all around, chasing the fishes. 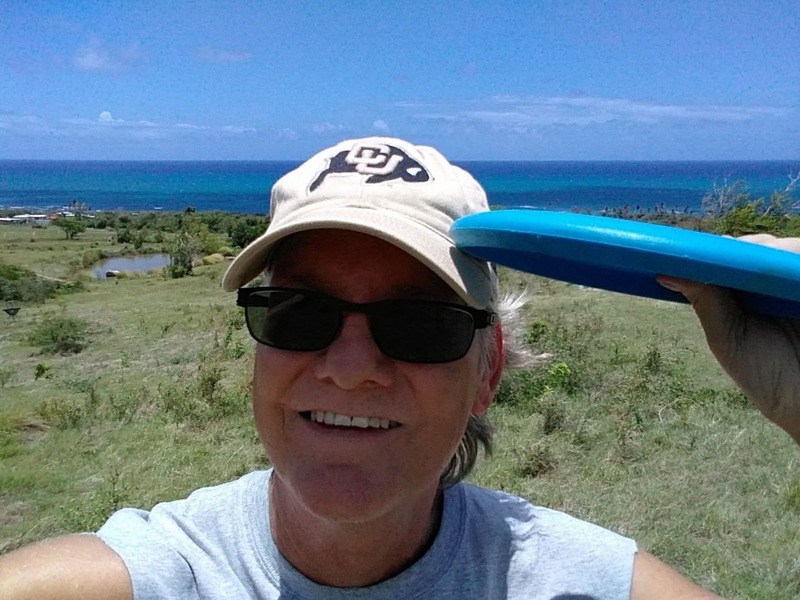 Disc Golf – We play disc golf, which like regular golf is fun and involves a lot of walking. Our main course is hilly so it’s up and down the hill, giving us a bit of a workout. 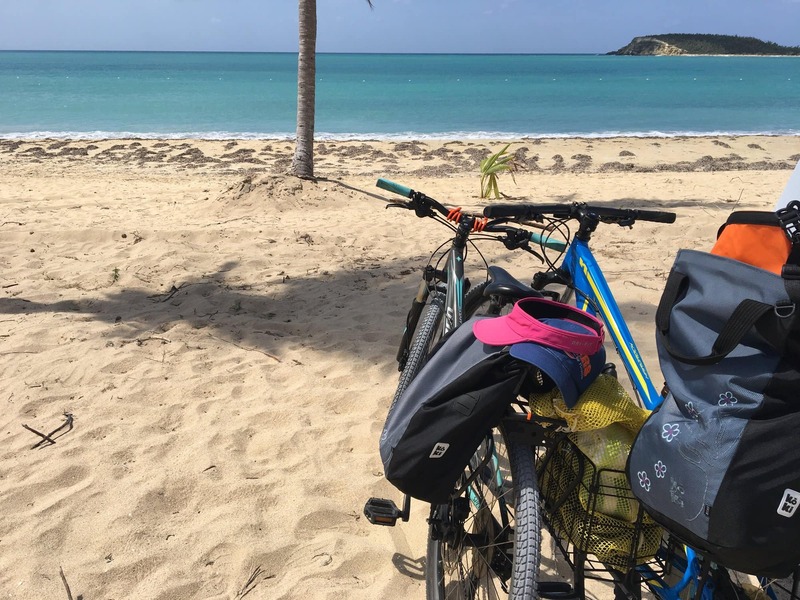 Bicycling – Riding bikes is a well-known workout; admittedly we’ve been doing less of this lately, but we still do pull them out from time to time just to ride. Deb runs a couple of times a week, and I ride along slowly as her security detail, with my bike pump in hand to fend off loose dogs. That’s usually my warmup for a home workout. Home Workouts – We do workouts at home on our yoga mats. 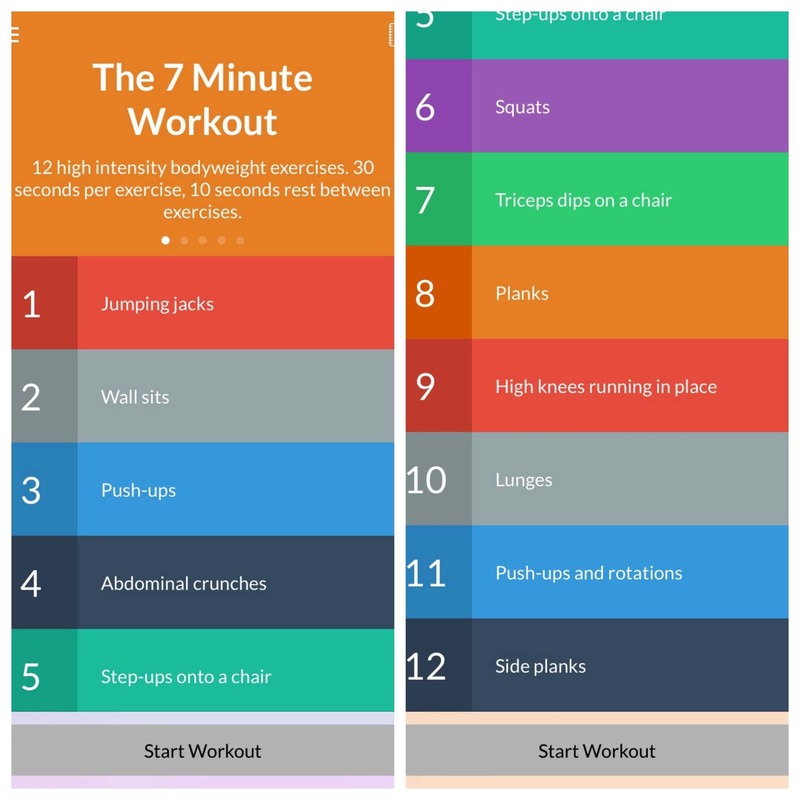 We’ll do the 7-minute workout app in a time crunch, or do it twice to get a (much) better sweat going. I’ve also done up to 1000 mixed abs at a sitting (crunches, twisting crunches, boat rows, scissor kicks, bicycles, push-ups, side planks). And if I just focus on pushups I’m able to do 60 of them before running out of gas (Update: I’m up to 100!). Deb does a Piyo DVD which is pretty killer, and sometimes we’ll actually use our yoga mats for yoga. Working out is one area that has dramatically improved for me since retiring. Deb’s always been very good about getting in her workouts but I wasn’t as good during my working years. Now, it’s much easier to make sure we do something every day and usually it’s a pretty strong workout. This is a key reason my weight is down about 8-10 lbs, and Deb’s is down 5-6 lbs, since we retired. I would think that our mental health is improved because of reduced stress (no work deadlines, no traffic, no hailstorms, fewer broken things because we just have fewer things). It certainly feels better! A group came by the neighborhood last week to check on peoples’ mental health, trying to see if anyone needed counseling or other help due to lingering hurricane PTSD. We told them we are fine, that we weren’t here during the storm and only came to the island later. After us, they spent a fair amount of time talking to a neighbor. We know there are some people here that remain affected by that horrible storm. The scars are on the inside and are not obvious, but the scars remain nonetheless. One example of our low stress life: we were heading out to get lunch at a favorite waterfront restaurant. It’s about a 10 minute drive away on the Caribbean side of the island. About halfway there, I realized I wasn’t wearing any shoes! But this is Vieques where you may see dogs, cats, and chickens in the restaurants, so I figured my bare feet wouldn’t hurt. And it didn’t. Lunch was good and nobody cared. Our active lifestyle is a positive contributor to our mental health, but we make other efforts in this area as well. Long beach walks with the doggies tend to set your mind straight, and keeping the brain engaged with things like writing this blog, learning Spanish, and general reading and learning, all this helps. Meeting new people, learning about different cultures and building friendships also correlates to a long and happy life. And because we enjoy it, we get that benefit “for free”. Having fun and laughing a lot helps too, as does a little down time here and there. So I can report our mental state is A-OK at this time. As for health care, we have a local doctor who checked us out together, which was pretty different. It was very interesting, not at all like in the States, very casual, as one of us sat on the exam table while the other sat in a chair. And then we switched. She talked to us for a long time, learning a bit about us and our lifestyle, checking on our mental state as much as physical. She proclaimed us healthier than her, and sent us to get lab tests a couple blocks away. After the hurricane, the lab building, like everything else, had some damage. Their sign outside, which normally proclaimed that it is the “Laboratorio” was missing a couple of the O’s, so it read “Lab rat rio”. It’s a good lab, but I still call it Lab Rat Rio to this day. We got our different blood tests, etc. and when the results came back a few days later, we went back to the doctor to go over them. All was great, and as you might expect, our blood pressure was lower than we’d come to expect when we were in the States. We just pay cash because our inexpensive health insurance has a very high deductible. Believe me, it’s worth a couple of $20 appointments to save thousands per year! She was also a good dentist, checking me out thoroughly, and telling me that now that we know each other, I need to come see her every 6 months. She likes to give her patients an event to help them remember when to make the next appointment. For Deb it’s just around Christmas, and for me, Three Kings Day. A note about appointments here: here they are more like general guidelines. At any of these doctors’ offices, I think it’s pretty typical to get either a 9:30am or a 1:30pm appointment. I think it’s the same at the vet too. If you want to be first, get there quite a bit before your appointed time and sign in. If you don’t care, just show up “on time”, and if you really don’t care, just show up when you want. It’ll all work out. Now, you should realize this is all preventative care. If we were to have an emergency, well first of all 911 doesn’t really work like you’d expect. You can try it, or call the police station, or call a friend. All are equally likely to be the right choice for you. 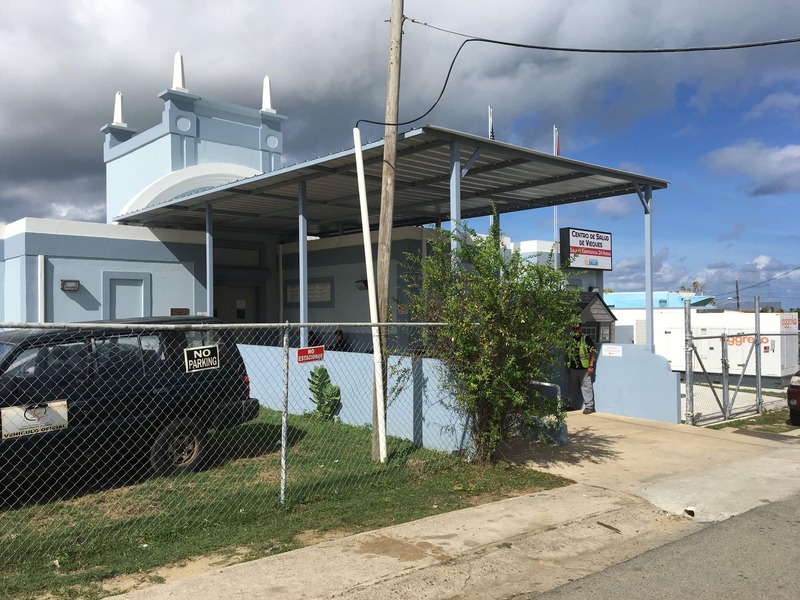 The hospital was closed after the hurricane due to water damage and mold, so the new “hospital” is in a church building a mile away from the other one. There are no signs to help you find it, you have to do that ahead of time so you know where you are going when the going gets tough. They treat basic stuff, but it’s my impression from what I’ve heard is that it is mostly just triage here. If something is really bad, you’re going to get a $30K helicopter ride to San Juan. It all sounds pretty bad, that our hospital is still closed 14 months after the hurricane, and honestly it is pretty bad. Pathetic, in fact. I shouldn’t be too down about it though – for half a year after the storm all we had were M.A.S.H tents! So things are improving at a glacial pace. And I should mention a friend here had a heart attack pre-María, which allowed him the opportunity to take that thrill ride to San Juan. They saved his life, and when he got back to the States he was told they’d done everything right in Puerto Rico. So we got that going for us. Which is nice! Hey, it’s better than a M.A.S.H. tent! Because of that lack of a real hospital, we tend to be very careful around things like knives, ladders, machetes, and other things that may send us to the church hospital. Maybe that’s a good thing! I do know that we’re healthier and happier here than we would have been if we’d stayed in the States. And as long as the hospital situation continues to go in the right direction, working it’s way back to the pre-María level, I see no reason not to stick around. No reason at all! TODAY’S SPECIAL: “I Believe“, by Soja, ft. Michael Franti & Nahko – In everything you eat and all the people that you meet, there is life, there is light, that’s reflected back on you. Well, well…as I was having a cup of java and finding nothing of interest to read on the net, up pops an email from our friends in the Caribbean. Have to say you pretty much answered my request about health and medical. Glad to see that you have a handle on local life and enjoying it wholeheartedly. I plan on visiting the island (PR) in January, but the closest I will get is Culebra. I will turn towards Vieques and toast both of you when I arrive. As for us here in the north,…winter is coming. In this blog about your healthy living, why is there no mention of beer? Beer? that comes next in the Fun blog :-). Beer is simply grains, green herbs, yeast and water, so yes, it was definitely an oversight to leave it out! You are correct Joe Bob – flying on airplanes, late nights, hotels, even the daily grind in the office, they’re no bueno for good health! Stay active – a body in motion tends to stay in motion. I think there is a fountain of youth on the island. 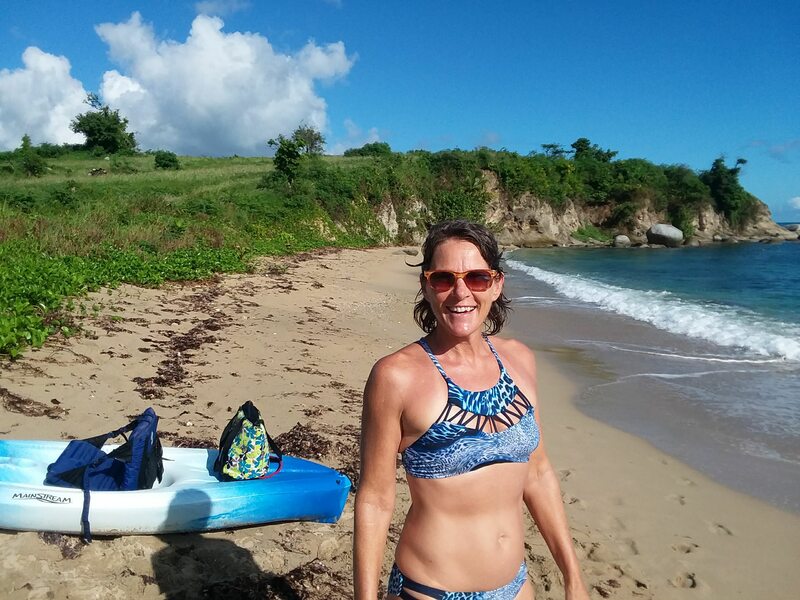 FB friends living on Vieques look younger and happier than their pictures living stateside. That’s why I am pigging out this Christmas! I keep telling myself that when we get there, island life will have the same effect on me. LOL, great blog! I know Deb looks great, but what about me? I’m 28 years old and people tell me I look older than that! 😉 See you soon Linda! Well, I eat pie sometimes but it’s not a habit! Glad to hear you’re working the retirement problem. Whether you are driving the car or not, it’s eventually going to get to a retirement destination. You may as well drive it!